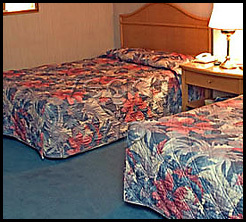 Hotel amenities : Concierge, four tennis courts, video arcade, laundry service, maid service, wake-up call. 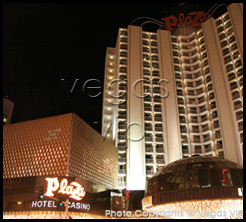 The Plaza Hotel and Casino is among downtown's most prominent hotels, clearly visible from many points of the city. 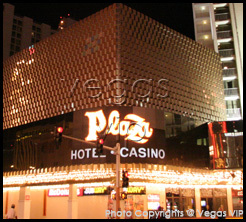 Situated on the west end of the downtown area, the Plaza sparkles with its brightly lit porte cochere that is seen in many movies set in Vegas. Restaurants such as the Omaha Lounge offer great food and live entertainment and with 1,037 rooms, the Plaza is one of downtown's largest institutions of hospitality. The 60,000-square-foot casino floor boasts 42 table games, more than 1,000 slot and video poker machines, a sports book plus a bingo room ・seldom seen in many hotels in Las Vegas.